The Bermuda Triangle is a mysterious place on earth where hundreds of ships and flights have reportedly gone missing. 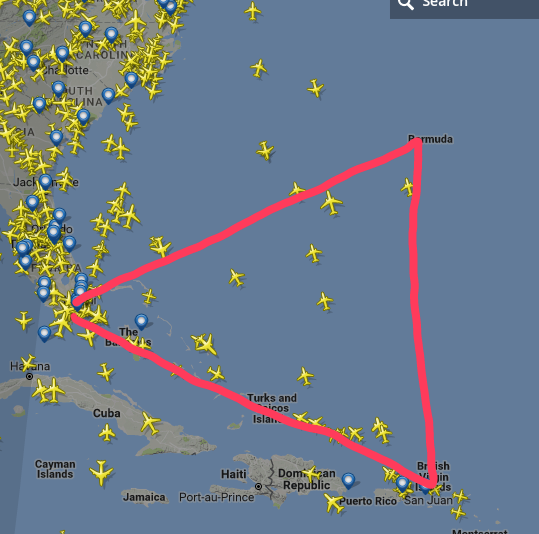 Do flights and ships still currently travel through the Bermuda Triangle region? Most reputable sources dismiss the idea that there is any mystery. The vicinity of the Bermuda Triangle is one of the most heavily traveled shipping lanes in the world, with ships frequently crossing through it for ports in the Americas, Europe, and the Caribbean islands. Cruise ships and pleasure craft regularly sail through the region, and commercial and private aircraft routinely fly over it. From personal experience, I can say that I have flown through the area several times without incident. The article also notes that given the proximity of the area to the Atlantic hurricane zone, the number of craft lost in the area is "neither disproportionate, unlikely, nor mysterious." It also notes that insurers do not charge higher premiums for vessels traveling in the area. I was stationed in the bahamas at a base that is situated well inside the "Triangle" in the NAVY. I was there for 10 years, and not a single incident involving military or any other ship or air craft in that time. Others have covered the Northern hemisphere. But, what about the southern hemisphere equivalent? Not the answer you're looking for? Browse other questions tagged air-travel adventure bermuda-triangle or ask your own question. Does the rotation of the earth affect the travel time from Europe to Australia? Are airlines allowed to move up the time of a flight?